Have you ever thought of Creating DATABASE in C LANGUAGE ? Or you might be asked in school or college to create temporary database in C Language using File Handling ! So, i thought of this and have created temporary database of taking Employee Details in C language using File Handling. STEP 1:- Just copy the above code and paste it in the "Notepad". STEP 2:- Go to "File" or simple press alt + f and Press "Save as" and save it with " .c " extension for example :- "DatabaseInC.c" or "DatabaseInC.cpp" . STEP 3:- Now, Save it to the desired Location. I would Suggest save it to "BIN" Folder Most Probably it would be here " C:\TC\BIN " . 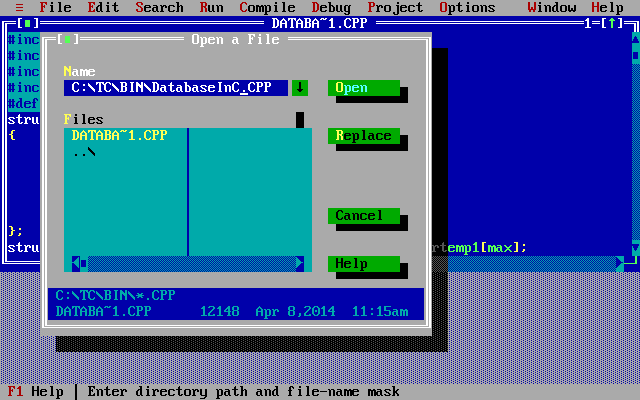 STEP 4:- Open "Turbo C" or "Borland C" and Press "File" Option or simply Press " alt + f " then, Click open or Simply Press " f3 "and write the Path wherever you have saved the file. If you've followed all the Instruction mentioned above . The File Would be here " C:\TC\BIN " and search for the file " DatabaseInC.c " or " DatabaseInC.cpp " and hit enter. Enjoy You've Just Created the Database In C Language.